Separate from the two former rope tow operations, a major ski area was once proposed for Mt. Agassiz. During the mid-1960s, there was an attempt to get government backing for over a million dollars in loans to develop the monorail, however the funding was likely not approved. Overall, the $1.5 million development would have included the monorail, a summit hotel and restaurant, and two T-Bar lifts. The Mt. Agassiz development was the second unsuccessful attempt at having a monorail-served ski area in New Hampshire (Attitash being the other). There are no known remains of the Mt. Agassiz Ski Area, other than remnants of the lost rope tow operations.
" 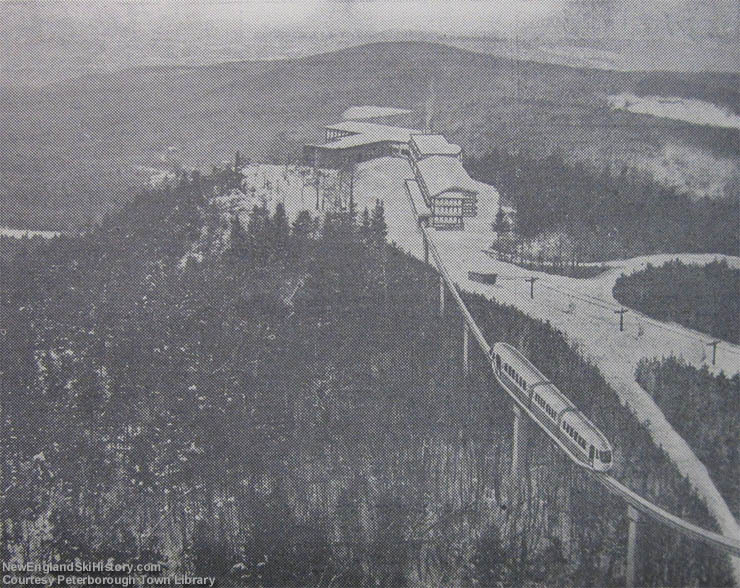 The first mountain monorail in the Americas, and the only one except for those which services the New York World's Fair, Disneyland and the recent Seattle World's Fair, is to be erected on New Hampshire's Mt. Agassiz at Bethlehem. A part of a $1.5 million project of the Mt. Agassiz Development Co. Inc., the monorail run of about one mile will require some 12 minutes. Besides being a boon to the summer business throughout the region, the project will provide the Granite State with its northernmost major ski area. Mountain-top lodge will initially have 40 rooms and dining facilities for 170 people. Up-ski devices will include a pair of T-bars. 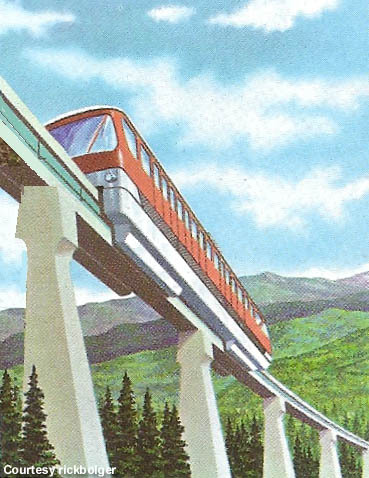 It is hoped that the monorail will get into operation by the summer of 1965 and that the entire project will be operative by the fall of that same year. " " Gov. John W. King and the state Executive Council have been asked to approve state backing for a loan to finance a monorail at the Mt. Agassiz ski area in Bethlehem. The State Industrial Park Authority today recommended the state back the $474,440 mortgage loan. Chairman James P. Rogers said his agency recommended the state guarantee half of the loan contingent upon other financial arrangemetns for the service. The federal Area Redevelopment Administration would first have to grant a $716,800 loan and there would have to be private investment of $381,500 in private capital before the state could assume its financial role. " " Several others are in the works but not scheduled for completion until the winter of '66. These include a $4.5 million development at Bolton, VT.; the first monorail ski area at Mt. 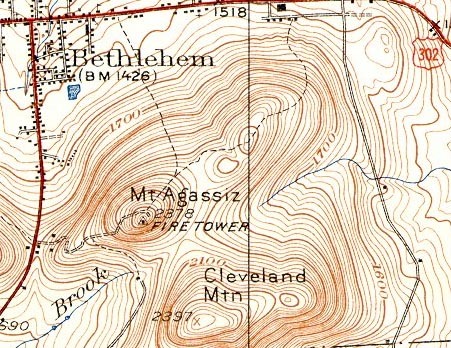 Agassiz, Bethlehem, N.H., and a three mountain complex called Kilkenny at Lancaster, N.H. "
" This 2,300-foot mountain overlooking Bethlehem's once hotel-laden Main Street would have been home to a mile-long monorail capable of transporting more than 400 people an hour to its summit. The northern slopes of the mountain would have been home to the ski slopes, which would have been served initially by two lifts and a number of novice and intermediate level trails. A base lodge and vacation home development were also part of the development plan put together by the Mt. Agassiz Development Corporation headed by F. Gordon Miller. " Dickerman, Mike. "Abandoned ski plans would have altered area landscape." Littleton Courier. 19 Jan. 2005. "No. Country Features Monorail" Petersborough Transcript. 23 July 1964. Courtesy Brian Hackert, Petersborough Town Library. "Skiing...It's a New Ball Game" Hartford Courant. 23 Jan. 1966. "State Asked to Back Loan for Ski Area" Nashua Telegraph. 2 Dec. 1964.